The usual suspects managed to get together for another game this past weekend. Some of them showed up late, Tom and I managed to get in a game before they arrived. Tom (7 frames & 24 systems) = (7 points per asset) * (10 assets) = 70 points. Me (8 frames & 30 systems) = (3 Points per asset) * (11 assets) = 33 points. At the start of game we're generally split between the two sides. Tom starts to push towards two of my stations that are near each other. I push towards his least defended station. I manage to destroy one of Tom's Gunner Frames in the process. Tom continues to push for my paired stations and I redouble my efforts to take one of his. I also try for a second of Tom's Stations. During this turn he destroys my two Assault Spiders. You can see one of my horrendous damage rolls in the lower left picture. I lose a Soldier Spider in my attack, but Tom loses one of his Cutter Frames and a Station. Then I lose my Artillery Spider and a Station in return. I lose another Soldier Spider and a Station. We tick the clock down to zero as Grafvonbarnez and Narbey have arrived and are waiting to join in. I really have to upgrade those Leader Spiders to 2Y. Scale differences can look really jarring in play. It was nice getting a game in after skipping May. 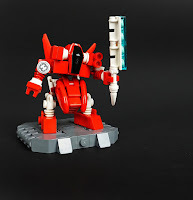 Wrapping up the Infernites tribe and the Series 4 Mixels. Parts. We've got quite the smorgasbord here. A Lightsaber Blade/Bar in black, a giant flame piece, another new Clip Tile, plenty of Slope pieces, some 1x4 Hinge Plates, a couple brackets, a few Apollo Studs, some Barbs, a couple Technic Ball eyes, a couple of my favorite piece, a Jumper Plate, several Clip Plates a few Tooth Plates, a Bar Plate, Mixel Joints, a Hinge Cylinder, and a Hinge Plate. The only pieces I'm not sure what to do with are the 2x2 Dome Bottoms. Build. Another T.U.R.D. Bot variation! Score: +20 (A+). It looks like the Infernites were the winning tribe from this series. Over the hump and into the home stretch, here's another Series 4 review for you. Parts. An abundance of regular Plates in this set. Plenty of Jumper Plates and five other types of Modified Plates too. Once again we've got a lot of different Slope pieces. The 1x2 Hinge Bricks are good, as is the 1x2 Modified Brick w/Studs on 2 Sides, and the Mudguards are fun too. Only a few Mixel Joints though. a sensor dome with the cockpit underneath in the central body. Score: +20 (A+). The Infernites tribe continues with another max score. 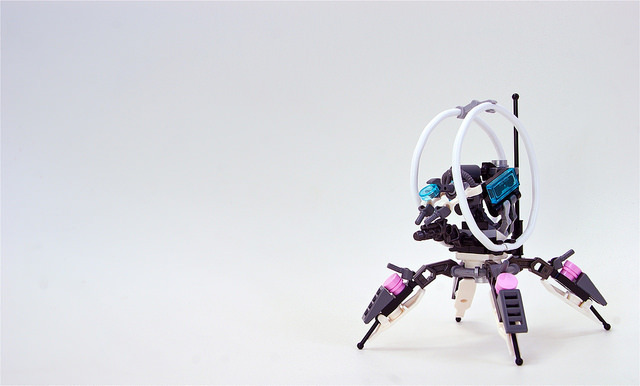 Heading into the home stretch, let's start the third tribe from Mixels Series 4. Parts. First thing I notice is the three new 1x2 Modified Plates w/Bars (both ends, closed). That Tile Clip in the center of the picture is one of the new ones. Other than that there's plenty of Slopes, Brackets, and Clip Plates. The 1x4 Bricks w/Horizontal Groove are interesting too. Not that many Mixel Joints though. Score: +20 (A+). Back on top with another max score. Let's wrap up the Orbitons, shell we? Bag. MSRP of $4.99 gets us a $0.10 Price per Piece. Parts. Plenty of Brackets, Clip Plates, and Cheese Slopes. Only a few of everything else though. The 2x2 Double Convex Slopes are pretty interesting as are the Technic Bricks w/Axle Hole. Score: +15 (A). A tiny bit disappointing after the last two from this series. 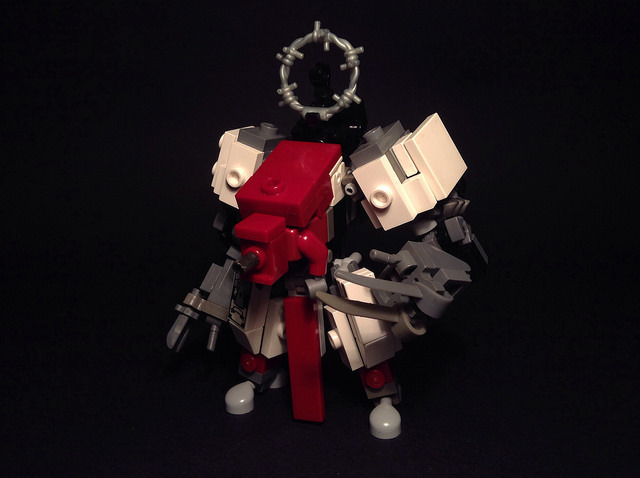 Number two of the Orbitons Mixels. Bag. MSRP of $4.99 gets us a $0.08 Price per Piece. Parts. Plenty of Slopes, Mixel Joints, Tooth Plates, and Brackets. A couple of taps, Lampholders, Clip Plates, Quarter Travises, 1x1 Vert. Bar Bricks, Robot Arms, and Minifig Heads. I'm not sure how much use the 4x4 Trans-Black Dome is going to be though. Build. I managed two out of this. A 4P Frame and a small IO Frigate. 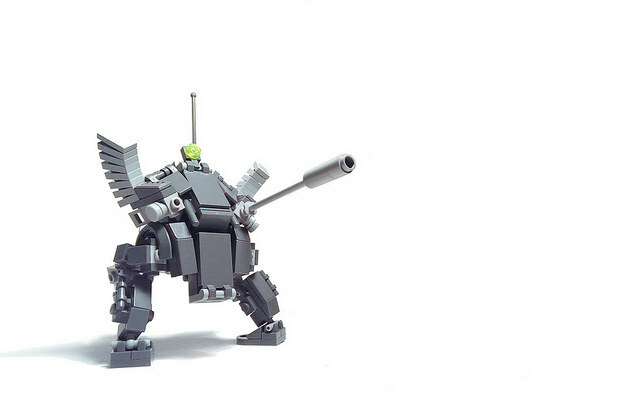 Let's finish out the week with more mecha goodness. Military Trooper X71 by Devid VII. This one looks great, it even has a mono-track base. And he's disabled downloading, which is weird because I've downloaded other stuff of his to this blog before. Microscale Exo Suit by cakeinmilk. 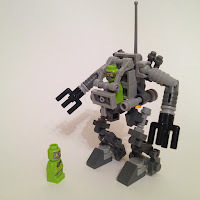 It's a 6P version of the 21109 Exo-Suit set. Headbot by roguebantha. 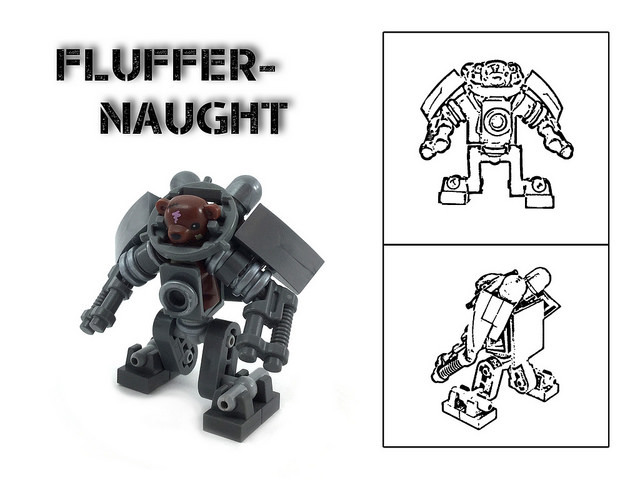 Possibly a little small for MFZ, but it looks great. looks like it could fit at 7P scale. 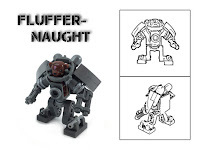 I like the use of the minifig torso. Not the one I had intended on starting with, but it was the first one I grabbed out of the bag. Parts. Plenty of Mixel Joints, oohh Lime 1x1 Round Tiles, a few Tooth Plates, a couple of Quarter Travis bricks, some Grille Tiles, my second fave part 2x1 Mod. Plate w/Bar (open ends), plenty of Slopes in five different varieties, a Tail Fin, a Clear 2x2 Dome, a Fire Piece, some Tiles and Plates, a White Mod. Plate 2x2x2/3 w/2 Studs on Side, and a Bar Holder w/Clip all look good. one of my T.U.R.D. Bots. Score: +20 (A+). Hey! Back on the right track. I think I'm going to run out and buy a bunch more of these. Target has the Classic Medium Creative Brick Box 10696 set on sale for $29.74 this week. At 484 pieces, that's $0.06 per Piece and it has a really interesting inventory. The rest of the Classic sets are also on sale at 5% off. 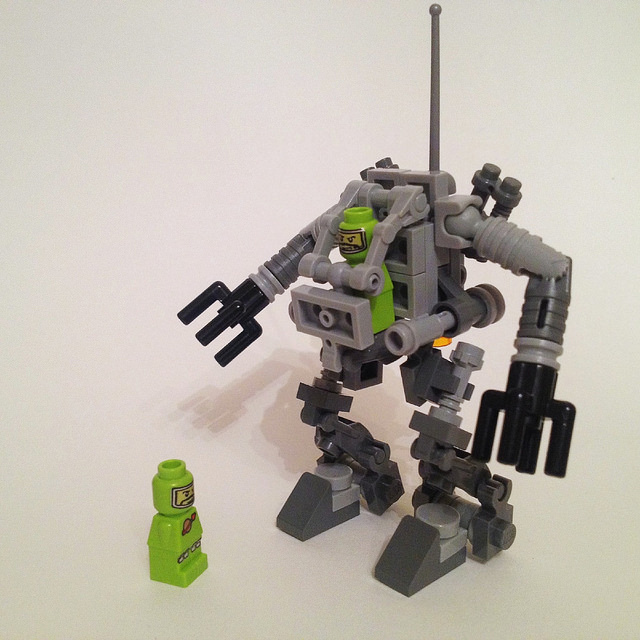 Some non-human mecha for you this morning as I had a lazy weekend. but it would look pretty cool on a gaming table. 3-47 AB "Warbird" by Ryan Romal. This one looks like a beast. 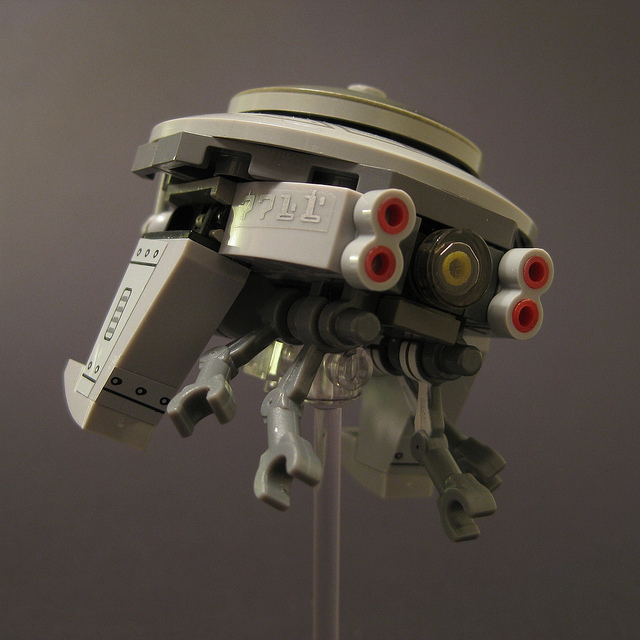 A-Drone 7711 by Wintermute2600. This is a tight build. 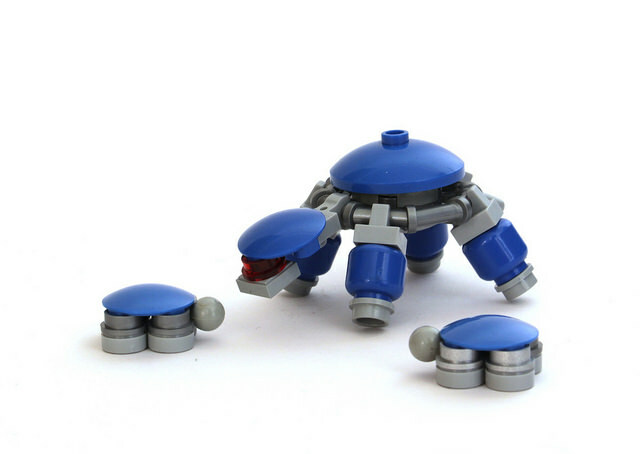 Baby Robot Turtles by Peter Reid. C'mon, they're really cute.